Over the past few months the "Games" section" on SHAMBLES has gone from strength to strength ... many thanks to the contributors ... check it out ... games to support most curriculum areas. One of the recently added links is to the Simulation of an IT Department which starts off ... " The IT manager - overworked and under appreciated. You know the story. Back in school, always the last to be picked for football, but the first one they ran to when they accidentally deleted a homework assignment." An email from a Principal last term brought to my attention that there were no resources on the Shambles website to help when writing Indemnity forms. "Shambles takes absolutely no responsibility for bad actions resulting from the reading or digestion of this newsletter or for any resultant changes in the weather"
Designed to be printed on A3 size paper, landscape & best in colour. Not only is there a blank version for you to customise but also one withThailand Public Holidays and one with the English Schools Foundation (Hong Kong) term and holiday dates on it. If you missed the IWB Convention in Hong Kong last month then you should find the following opportunity of interest. IWBNet, with the support of the University of Hull will be conducting between 10 –22 October 2005 the first global, online conference on the use of IWBs in schooling. IWBNet 2005 will examine the latest developments world wide with interactive whiteboards (IWBs) that can improve teaching and learning. OK ... so Australia and New Zealand are not in S.E.Asia (some would argue otherwise) but they are so close and have some wonderful materials, that can help International Schools, that it is about time I mentioned some. Australia : Free Primary School Lesson Plans & Education Resources and an excellent free weekly email newsletter containing reviews of websites. New Zealand : kia ora (Greetings) - another excellent website with a lot of local cultural materials (as do the other two sites here). The newsletter contains not only links to websites but also 'teachers tools' and 'research' info. EdNA Online is a service that aims to support and promote the benefits of the Internet for learning, education and training in Australia. It is organised around Australian curriculum, its tools are free to Australian educators, and it is funded by the bodies responsible for education provision in Australia - all Australian governments. EdNA offers several regular emailed newsletters each customised to a specific audience e.g. early childhood, schools, higher educators etc. "A WebQuest is an inquiry-oriented activity in which most or all of the information used by learners is drawn from the Web. WebQuests are designed to use learners' time well, to focus on using information rather than looking for it, and to support learners' thinking at the levels of analysis, synthesis and evaluation." It appears that the use of webquests has been used as a learning resource by USA curriculum schools before others. Often teachers evolve through using virtual field trips and scavenger hunts before stepping into the world of WebQuests themselves. WebQuests were the original conception of Bernie Dodge from San Diego State University. The original WebQuest site can be accessed at http://webquest.sdsu.edu/webquest.html there are now many other sites. A UK site, WebQuestUK at www.webquestuk.org.uk/, holds true to the original concept but attempts to link quests to the UK National Curriculum. This internationally focused course is suitable for senior managers in schools and colleges or in government or other agencies concerned with schooling. The course is made up of four modules and a dissertation supported by specially written materials and additional readings. 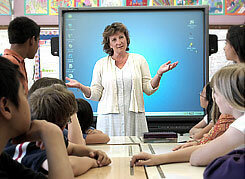 Groups of 10 students work together online under the guidance of a personal tutor. will consider strategies to improve educational organisations and reflect on the values that underpin them. will gain a critical understanding of the policy context of education and its practice. will be encouraged to reflect on key areas of theory and empirical research relating to their own unique work environment. will develop a greater appreciation of their own and colleagues' professional development needs . The 5th annual South East Asian Mathematics Contest took place at Dulwich International College, Phuket on 25, 26 February 2005. The contest attracted 38 teams (114 students) from 22 international schools across SE Asia - its biggest entry yet. 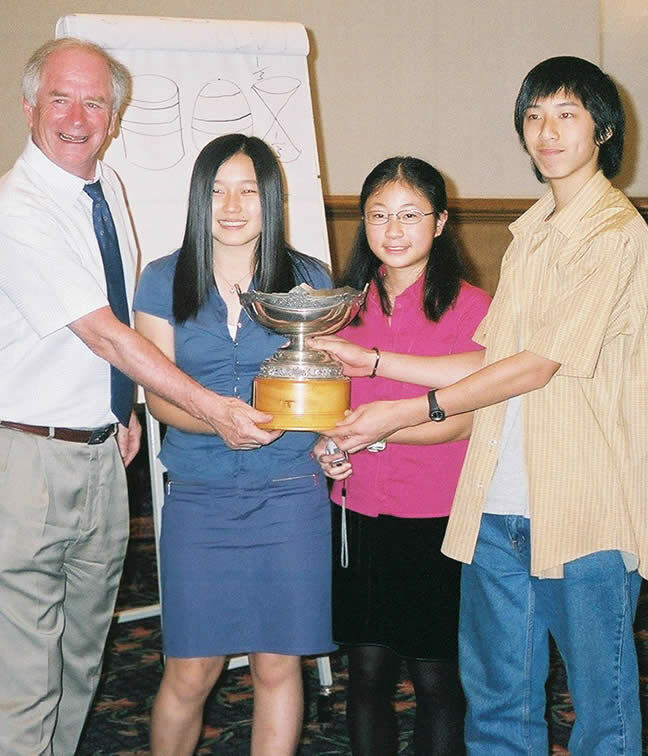 Island School, Hong Kong was victorious, winning the Warry Cup for the 3rd year out of 5. In fact not only did our team of Tiffany Lau, Min Ha Lee and Kelvin Ng (all year 10 students) win the team competition, but our other team - Michael Brown, Yuan Zhang (both year 11) and Frederick Law (year 9) came second! Never before has the same school come first and second in the contest. A team from Australian International School, Singapore came third and Garden International School, Kuala Lumpur were fourth. In the individual contest, Island School had 4 students in the top 10, and Tiffany Lau was the winner. Second was Vivian Tong, German Swiss International school, Hong Kong. In third place Low Zhen LIN, Garden International, KL and Kelvin Ng of Island School, HK was fourth. Check with Paul Jackson at Island Sch. BCIS school does not open until August 2005 but it already has a rather different website. It is made with 'Flash" and makes use of children's voices in the main menu .... but have patience as it is a little slow to load unless you have a fast connection. Normally I do not like music on websites, but it seems to work here ... and you do have the ability to turn it off. e-Strategy 'Harnessing Technology: Transforming learning and children's services'. This UK strategy describes the use of digital and interactive technologies to achieve a more personalised approach within all areas of education and children's services. It is an ambitious strategy covering all sectors for the next five years and beyond. The aim in five years time, by using a more strategic approach, is to build the common ground that brings all education and children's services to the critical baseline of being able to use the technology effectively. It is designed to harness technology to the needs of children, learners, parents, teachers, carers, employers and all stakeholders. We are only able to do this if we are clear about what we want as well what we need, and how by using ICT this will be achieved. The conference will focus on five key sub themes: information literacy, information policy, knowledge management, social responsibility, and leadership. Even the pre-conference hands-on workshops are attractive on their own ... on Friday 8th : "Collection Evaluation" and "Assessing Information Literacy: Cycles of Inquiry"
IBPALMS is an organisation dedicated to supporting Librarians and Media Specialists in International Baccalaureate schools in the Asia Pacific Region. IBPALMS has offered conferences (traditionally every two years) in Penang, Singapore and most recently in March 2003 in Beijing. This year, we will be hosting Workshops for the IB programs during the IASL Conference during July in Hong Kong, not only for schools currently running the IB, but also for schools that are considering becoming an IB School. Our next conference has been approved by the IBAP for March 2006 in Osaka, Japan. If you are a Teacher Librarian in an IB school in the AsiaPacific region, we would like to invite you to join our Yahoo group which provides a support network for Teacher Librarians to discuss issues pertaining to libraries in the Asia Pacific region as well as a support network whether for curriculum development, purchasing resources or locating suppliers. Another academic year is coming to a close (at least north of the equator) and the recruitment exercises for the new year are being completed. Many schools already have information to help induct teachers into the new environment and possibly into new cultures making the move a double challenge. In this "Shambles" area there are links to a number of websites and resources that could help with this task. It used to be straight forward when there was just the plain old copyright symbol even though it was not much practical use .. you could either use the work or not. Creative Commons (USA) took up the challenge to offer creators of digital materials more choices than just "open to all with no control " or " open to no one "
Free for Education (Australia) has a number of different licence symbols specifically for education. The Creative Archive (UK) "is a new BBC led initiative to provide access to public service audio and video archives in a way that allows the British public to find, share, watch, listen and re-use the archive as a fuel for their own creative endeavours. In other words, you can rip, mix and share the BBC." 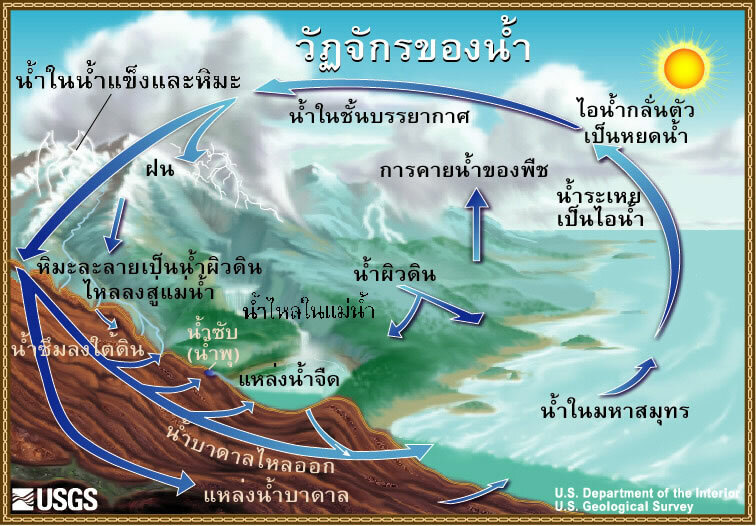 This US Geological Survey department has produced a new resource to support a topic that is taught in classrooms all over the world : The Water Cycle. The reason for mentioning it here is that they have produced not only an impressive illustration but they have versions available in over 50 languages. There is a downloadable version for teachers without any text plus a test diagram and finally the option to follow a drip through the water cycle ... and all free. 9-10 May 2005 The Landmark Hotel, Bangkok .... in one week ! Practitioners will learn about the theory and practice of the essential components of development, marketing, alumni relations and philanthropy, but the conference will also have a management and strategic component of appeal to school Board members and Heads. 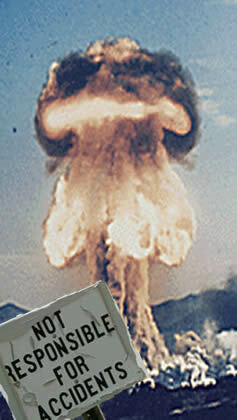 Got a prayer or a problem for the new pope? Now you can e-mail him. It would be appreciated if you could download and print out this A4 notice for your staffroom. P.S. I hope to be offering a session on "Free Science Resource (k-12) with an ICT Bias"
SHAMBLES has a list of Ed.Psychs in Asia who are available to work in schools ... but not many countries are covered. ASA aimed at developing a child's soccer skills. After 3 years this outdoor education centre seems to be going from strength to strength with over 1,000 students having visited this year alone. For recent pictures related to community work click on : building a village or students teaching English.